Heat large nonstick skillet over medium heat until hot. Add Ground Beef and onion; cook 8 to 10 minutes, breaking beef into small crumbles and stirring occasionally. Pour off drippings; season with salt. Stir in tomatoes, carrots, raisins and almonds. Cover and cook 8 to 10 minutes or until carrots are tender, stirring occasionally. Remove from heat; cool slightly. Stir in 1/2 cup cheese. Set aside. Heat oven to 350°F. Cut slit lengthwise down 1 side of each jalapeño to create pocket, leaving stem and tip intact. Make another small crosswise cut just below the stem to form T-shaped opening. Remove and discard seeds and membranes, if desired, being careful to keep peppers intact. Spoon generous 1 tablespoon beef mixture into pocket of each jalapeño. Place on metal baking sheet. Top each evenly with remaining 1/2 cup cheese. Bake in 350°F oven 30 to 35 minutes or until peppers are tender and cheese begins to brown. Garnish with sour cream and lime wedges, if desired. To control the level of spicy heat, remove and discard some or all of the seeds and membranes from the jalapeño peppers. To easily remove seeds and membranes, use the small end of a melon baller. 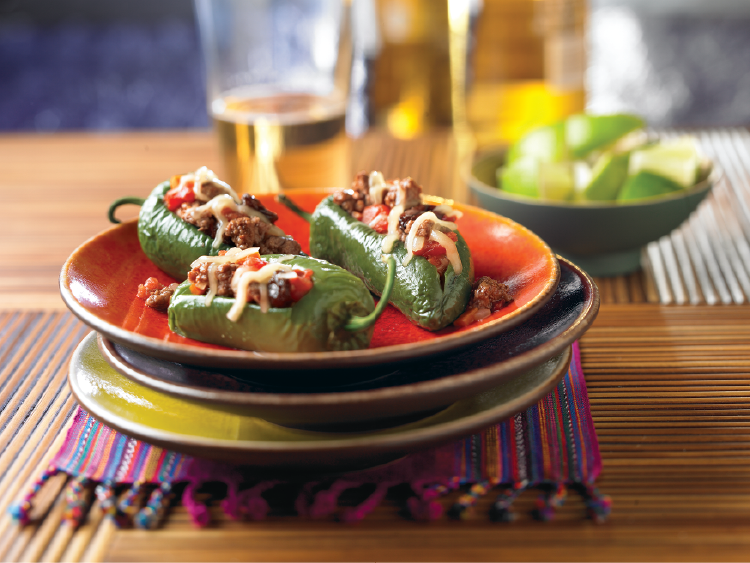 Picadillo-Stuffed Poblanos Variation (Entrée): Prepare recipe as above, doubling the amounts of ground beef, onion, salt, carrots, raisins and almonds; use 1 can (14-1/2 ounces) diced tomatoes, drained. Substitute 4 large poblano peppers (about 5 ounces each) for the jalapeño peppers; the cheese amount remains the same. Cook beef-tomato mixture 10 to12 minutes or until carrots are tender, stirring occasionally. 59 calories; 3 g fat (1 g saturated fat; 1 g monounsaturated fat); 11 mg cholesterol; 92 mg sodium; 4 g carbohydrate; 0.8 g fiber; 4 g protein; 0.7 mg niacin; 0.1 mg vitamin B6; 0.3 mcg vitamin B12; 0.4 mg iron; 2.3 mcg selenium; 0.7 mg zinc.